Hyde Abbey no longer exists but what does remain is the gatehouse and the ruins of the arch that crossed the abbey millstream. They along with Hyde Gardens can be found just outside what was the northern gate to the city. From North Walls go along Hyde Street to King Alfred Place. 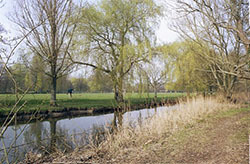 This is a pleasant area that leads in also to North Walls Park and nearby is Winnall Moors Nature Reserve. Hyde Abbey is a little out of the way of the centre but worth the effort particularly on a nice day and a picnic perhaps. © Copyright GaryReggae and licensed for reuse under this Creative Commons Licence. The Abbey was a Bendictine Monastery that succeeded the New Minister when that was demolished. That had become rather surplus to requirements in the central area of the city with the advent of the new Cathedral. It was Henry I who ordered the removal. This was a more spacious site for the Monastary anyway. Nice area. Plenty of water and green fields, new building. The consecration took place in 1110. It was a very grand occasion with ceremonies and processions. 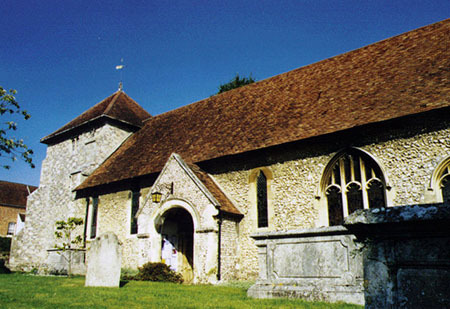 The bodies of Alfred the Great, his wife Ealswith, founder of Nunnaminster and their son Edward the Elder, were carried with great ceremony to the new Abbey and buried in the most significant place in the Church, before the High Altar. They had been buried originally in the Old Minster, then reburied in the New Minster. Alfred the Great and his son were Saxon kings and this was Norman Winchester. Pilgrimages were holidays. Today we all go to places of interest or the beach. Those days people went on pilgrimages to places where saintly relics were kept. 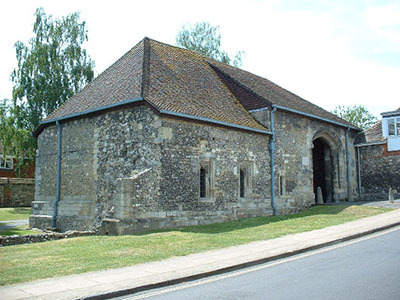 Pilgrims Hall in the centre of Winchester was a place for people to start their journey to Canterbury. Hyde Abbey was not far away for those pilgrims to visit before they went. It was also a pilgrim's place in its own right. With the royal burials and other saintly relics this place was important. All the relics came along from the Mew Minster in the procession with the Royal family. The Abbey became a busy centre for pilgrims. Only thirty years later Winchester burned and the Abbey suffered a lot of damage along with it. This was the war between Empress Matilda and her cousin King Stephen for the throne of England. Generally known as the Anarchy it was a nineteen year civil war. Empress Matilda was the daughter of Henry I who ordered the building of Hyde Abbey. The damage to the Abbey was so severe it had to be rebuilt. Nevertheless it became a reasonably well off Abbey. Troubles came again in 1539 with Henry VIII and his dissolution of the monasteries. He demolished this one thoroughly as he did so often during his reign. The relics were removed and disposed of. The British Library contains some books that did survive the carnage of the Abbey. King Alfred, his wife and son were reburied again, burial number four, this time at the east end of the churchyard of St Bartholmew's Church in King Alfred Place nearby. Just a simple grave to honour those great names of the Saxon period. The tower at St Bartholomew's Church was constructed with materials from Hyde Abbey. So perhaps with this and the burial of the Royal family, St Bartholomew's can be said to be the successor of Hyde Abbey, The New Minster and the Old Minster. All so much part of the history of Winchester and England. St Bartholomew's Church, King Alfred Place, Winchester. © Copyright Michael FORD and licensed for reuse under this Creative Commons Licence.